Entries from Digital Intelligence tagged with "hulu"
Spotify and Hulu have formed an agreement for the music streaming service to offer select Hulu-owned TV and movie content to its own subscribers. Spotify has partnered with Hulu to let students in the US get both a premium Spotify subscription and a subscription to Hulu for a combined price of $4.99 a month. This chart shows the breakdown of audiovisual revenue per region by audiovisual type. North America's audiovisual revenue is split the most diversely between linear TV, on-demand services and home video (such as DVDs). 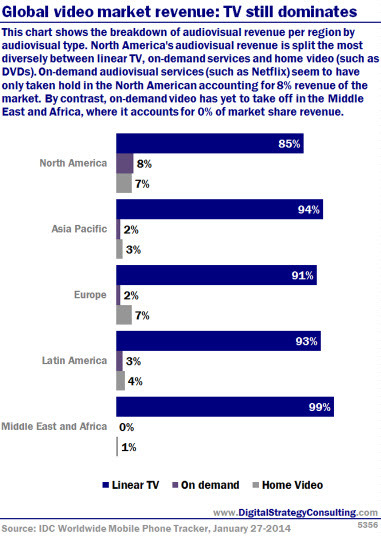 On-demand audiovisual services (such as NetfIix)seem to have only taken hold in the North American accounting for a % revenue of the market. By contrast, on-demand video has yet to take off in the Middle East and Africa, where it accounts for 0% of market share revenue. Google is working on an internet TV service that will compete with the likes of Apple TV and Sony, according to a news report. Yahoo has reportedly made a bid for video streaming site Hulu valued at between $600m and $800m, as CEO Marissa Mayer’s media buying spree continues. Yahoo is considering another bid for video streaming service Hulu, after negotiations with rival Dailymotion failed, according to reports. Nielsen is testing a new tool that lets TV networks track viewing of shows on their websites. While traditional TV is still the major player in most US households, DVRs now appear in 44% of homes, up almost 80% since 2007. This report and video from Nielsen looks at the rise of connected TV, and how it will impact marketing in the future. Hulu’s media ownership partners are close to buying out one of their number. NBCUniversal, News Corp., The Walt Disney Company and members of the Hulu team are to purchase the stake owned by Providence Equity Partners at a price that values the company at $2 billion. The number of homes in the US subscribing to paid cable TV is falling, as consumers switch to free TV and online streaming for their media needs, according to new research. Americans spend more than 33 hours per week watching video across the screens, according to the latest Nielsen Cross-Platform Report. But how they’re consuming content—traditional TV and otherwise—is changing. US-based video streaming site Hulu will debut its first original scripted series, the political docudrama Battleground, next month. The move marks another step for HUlu to becoming a full-fledged alternative to cable television. Launching on February 14th in the US, the show stars a cast of mostly young unknowns, the show chronicles a hardscrabble primary campaign for the Wisconsin senate. The consumption of recorded television and Internet-delivered programming is quickly surpassing live TV viewership, according to new research from TiVo. Nearly two-thirds of the viewing on web-connected TiVo units is now delayed television or on-demand video via broadband (OTT). US consumers are using their Xbox 360, PlayStation 3 and Wii devices to stream movies and TV shows in growing numbers, according to a new survey. The poll of 3000 people in the US, conducted by Nielsen, found that streaming video accounted for 14% of the average time spent using Microsoft 's Xbox 360 in October, up from 10% a year earlier. For Sony's PS3, the share of streaming video was 15% this year, up from 9% last year. The shift was even more dramatic for Nintendo's Wii, which jumped to 33% from 20%. Global consumer spend on online video has exploded in 2011, reaching $3.5bn in total for the year, according to new research. The study, entitled Global OTT Video Forecast: Q4 2011, from Strategy Analytics, found that subscriptions rather than one-off transactions will drive the growth over the next few years. US-based online video site Hulu has ended take-over talks with Google, Yahoo and Dish Network after its owners decided to focus on building the site’s ad and subscription revenues instead. The three owners of Hulu, News Corp., the Walt Disney Co. and Providence Equity Partners has been hoping to to fetch $2bn out of a potential sale of the company. However, last Thursday, the three firms issued a statement saying they saw more value in retaining the popular 3-year-old service than in selling it off. Amongst US online video sites, Hulu generated the most video ad impressions, according to new research. The study, from comScore, showed that Americans viewed more than 5.6 billion video ads in August, with Hulu generating the highest number of video ad impressions at 996 million. Tremor Video ranked second overall (and highest among video ad exchanges/networks) with 764 million ad views, followed by Adap.tv (720 million) and BrightRoll Video Network (603 million). Yahoo has updated and rebranded its online video site, as the online media firm looks to take on Hulu and YouTube in the video-on-demand market. Yahoo Screen functions as a hub where users can watch thousands of original and licensed video clips that used to be scattered across Yahoo’s content network. A group of human editors is hand-culling the material into distinct channels that include both snippets as well as complete television shows, like Modern Family and CSI, and shows from over 70 online sites, like Funny or Die and Break Media. Apple is mulling an acquisition of US-based online video service Hulu, according to a Bloomberg report. The news agency reported that Apple is in early talks that may lead to an offer for Hulu, quoting ‘two people who weren’t authorized to speak publicly’. Yahoo has reportedly approached Hulu to discuss a possible acquisition of the popular online video service, according to a person with knowledge of the matter. The Los Angeles Times reported that word of Yahoo! 's unsolicited offer was confirmed by a person close to the company, but noted it remained unclear whether the offer had come directly from the Internet firm or another entity. Hulu, which streams television shows on the Internet, has been the subject of intense speculation about its future. 176 million U.S. Internet users watched online video content in May for an average of 15.9 hours per viewer, according to new research from comScore. The total U.S. Internet audience engaged in more than 5.6 billion viewing sessions during the course of the month, the data revealed. 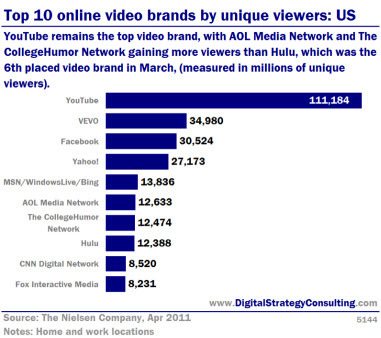 YouTube remains the top video brand, with AOL Media Network and the College Humour Network gaining more viewers than Hulu, which was the 6th placed video brand in March, (measured in millions of unique viewers). 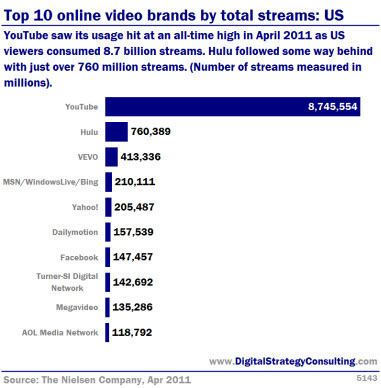 YouTube saw its usage hit an all-time high in April 2011 as US Viewers consumers 8.7 billion streams. Hulu followed some way behind with just over 760 million streams. (Number of streams measured in millions). 172 million U.S. Internet users watched online video content in April for an average of 14.9 hours per viewer, according to new research from comScore. The total U.S. Internet audience engaged in more than 5.1 billion viewing sessions during the course of the month.